Even when my husband and I are in Crete, like now, our taste buds do occasionally wander from “classic” Mediterranean dishes. And I will sometimes even venture into baking sweets. So I recently took a few steps off the beaten path and gave the classic French Tarte Tatin a try. As with many traditional recipes, Tarte Tatin has some disputed history. However, it is generally accepted that the dessert came from the Hotel Tatin, south of Paris, in the 1880s. The hotel was run by two sisters, Stéphanie and Caroline Tatin. Apparently Stéphanie started making an apple tart but left the apples cooking on the stove for too long. She rescued the dish by putting the pastry base on top of the apples, and then finished the cooking in the oven. She turned the pie upside-down onto a plate. The hotel patrons loved the result and this alternative to a traditional apple pie became a staple. Lay out a large piece of waxed or parchment paper on a flat surface and very lightly flour it. Lay the 2 pieces of cold puff pastry on the paper, overlapping the edges on one side by 2 inches. Gently press the overlapped area together with your fingertips to seal it and make one large piece. 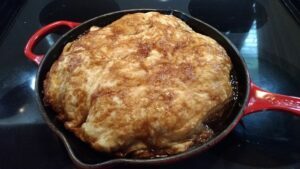 Turn your skillet upside down and very gently lay it in the center of the pastry (you don’t want the skillet to push down on the pastry too much). Measure out 2 inches from the edge of the skillet and cut a circle out of the pastry; throw away the excess. Remove the skillet, roll up the pastry with the paper and stash it in the refrigerator to keep it chilled. Peel and cut the apples in half. Scoop out the core using a small melon-baller, if you have one, or a teaspoon. Put the butter, sugar, salt, ginger and cinnamon in the bottom of a 10-inch iron skillet. Place the skillet on the stove over low heat and stir gently until the syrup ia completely melted and mixed. Lay the vanilla pod halves on top of the syrup in the shape of a cross. Place the apple halves in the skillet, flat side down. If you can’t fit all of the halves into the skillet, and there is space left, cut the remaining halves into chunks and gently stuff them into the spaces. Stud the apple pieces evenly with the cloves. Remove the puff pastry from the refrigerator and carefully unroll it over the apples. Tuck the edges of the pastry underneath the apple halves all around the skillet. Make several 1-inch slits in the pastry with a sharp knife. Increase the heat to medium and cook for about 15 minutes shaking the pan and rotating it regularly. When syrup forms in the base of the pan and it turns light amber, dip a pastry brush into it and paint some evenly over the puff pastry. Make sure to cover the entire surface of the pastry to encourage even browning. Place the skillet in the preheated oven. Bake until the pastry is a deep golden color, about 20-25 minutes. Remove the skillet from the oven and let it stand for 5 minutes. Shake the skillet gently and place a large, flat plate on top. Fold a tea towel into each hand to protect yourself from the skillet’s heat and the hot caramel. Grab the skillet and plate together and then quickly and carefully flip the tart onto the plate. Cut into pieces and serve hot. 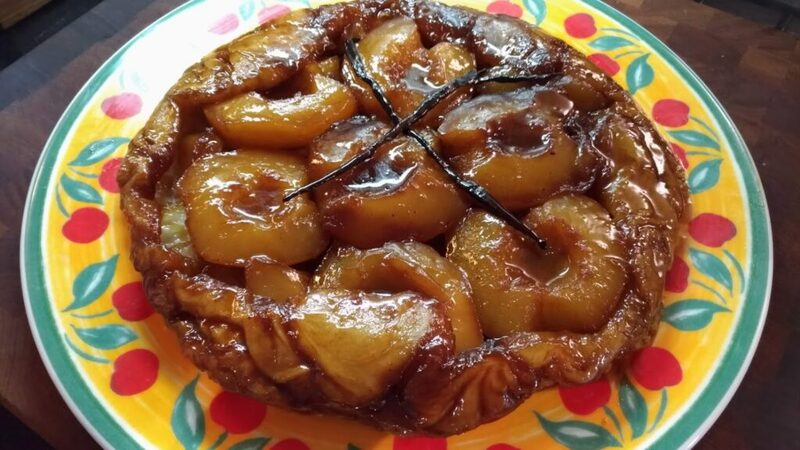 • Use a tart, “apple-y” apple that will hold its shape during cooking; you don’t want applesauce when you turn your tarte. I suggest Pink Lady, but Granny Smith is good, too. • Make sure the apples completely cover the skillet’s bottom. Pack the apple pieces neatly and tightly together because they will shrink during cooking. • Use a spoon to tuck the edges of the pastry in and under the apples, being careful not to burn yourself on the caramel. Well-tucked pastry will give you nice sides and deliciously gooey edges. • A few random, 1-inch slits in the pastry will allow steam to escape during cooking so the top of the pastry bakes up nice and crisp. • Don’t be afraid to let the pastry get dark. You want to be sure that the apples are cooked through, that the pastry is flaky and that the flavor is nice and rich. • Place your serving plate over the pan, using a folded tea towel in each hand for protection from the heat and the hot caramel (thick, stiff pot holders might not give you enough grip). Hold the plate and the pan together firmly, and quickly and carefully flip the pan upside down to invert the tart onto the plate. Practice this step before-hand with an empty skillet and a plate to get used to the movement.